It’s about the easiest thing to do in the world- Sit pretty and criticize. Many are guilty of it. At one time or the other we have had cause to pass judgement on other people’s work. Sometimes we do it rightly, but many times wrongly. People criticize anything and everything. Armchair critics are the hardest people in the world to please. Someone starts a business – they criticize the idea behind it, another puts out an album-they criticize 80 percent of the tracks on it, yet another displays his paintings- and yet again the armchair critics are quick to point out those areas that are “lacking” in his art, even though they don’t have the faintest idea about how to hold a paintbrush! Writing and by extension blogging was something I always fancied myself doing, I had the nudge somewhere within me that I was good enough to do it, but I struggled!…oh I struggled internally to finally take the big step of putting my writing out there. Over the years I wondered if I could really do it. I wondered if people would ever read anything I wrote. I knew how brutal people could be with their criticisms, but that didn’t bother me as much as being sure I could put out good content. Yes, I wanted to write but it was also important to me to do it well, knowing that I would also criticize any work or craft that was below standard, which is one of the upsides of criticism. It helps us put our best foot forward. If you are a chronic critic, you are condemned to ensuring you get it right whenever you do your own thing, as yours will be a sad story if after being overcritical of other people’s work, you end up doing something sub-standard. It’s the burden a critic has to bear! I am of the opinion that the biggest critics usually have little to offer when faced with the challenge of doing better that which they condemned in others. For instance, I never believed the late human rights activist and social critic, Chief Gani Fawehinmi would have achieved much had he won the presidential election he contested in year 2003. For all intents and purposes, he was a fantastic Lawyer and crusader of the common man’s cause, but I felt he was too much of a critic to be able to get much done. I believe he would have spent most of the time hunting down corrupt ex-government officials to the detriment of actually seeing to the task of nation building. It is one thing to criticize, it is another thing to perform. When the Governor of Edo State, Adams Oshiomole told a poor widow to “Go and die” out of anger, many were surprised that the former fiery labor leader could utter such words when only a few years ago he would have been the one calling attention to the widow’s plight! I was gutted too but it only reinforced my belief in critics not necessarily being the best performers or managers. Even widely respected world leaders like the late Mahatma Gandhi and Nelson Mandela who many saw as perfect, had their shortcomings. It is okay to criticize, but by all means do it constructively. Now that I write actively, it is more difficult for me to criticize another writers work because aside the fact that every writer has their own style, I know it is not exactly a walk in the park. Therefore, If I was asked to critique a write-up, I would be truthful but considerate in doing so. Which also explains why the professional critics who are required to review a book or judge a talent show are usually more apt with words than the average person who knows next to nothing about the art and will most likely just make a sweeping comment. The answer is simple, they have been in those shoes, they know where it pinches! …..Another nice one for a cool wednesday……..after a long weekend! Weldone Lolo! Been so busy lately dat I hardly had time to read thru ur posts.Hmmm,I must confess I was guilty of this until few years back.I got to learn that every human has got his/her own unique abilities and as such, even if I’ve got any reason(s) to criticise,I usually apply diplomacy. WHY?? The truth MUST be said,but in a loving and caring manner. Semmie is back! So good to read your comment again. Thanks babe. Happy birthday to ur mum! 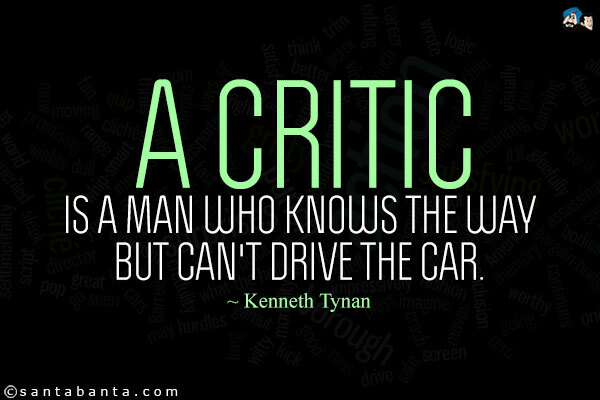 Critics r everywhere, but criticism shuld always be constructive. I feel some pple are sadists trying to ruin ones work n feelings, those people never see anything good about another individual but this should never make us give up/ relent in our passion. Constructive criticism is always appreciated and makes us better. Thank you Anwuli. Criticism should never stop us from pursuing our passion…true. Criticism is meant to make us better in whatever we have chosen to do but it should not be done in a harsh uncaring manner. I agree we all criticise one way or d other but some people are natural born sadists who never see any good in what other people do and they can never and will never be any better regardless how hard they try. Nice one Ololade. Double thumbs up. I couldn’t agree more Bibi. Thank you. Spot on! We are all guilty of the above but on varying levels. Some unfortunately are quite chronic! We however find ourselves on the “hot seat” and then underperform. I agree with you completely, if one must criticize, one should strive as much as much as possible to make it constructive. Otherwise, the bucal cavity should be held shut! Hahaha @ the buccal cavity should be kept shut! Thanks dude. Meanwhile, this is to wish your mum a very happy birthday. Wish her many more happy years in fulfilment and sound health. You have stylishly exposed something seemingly good that follows being a critic. I hope it works that way all the time but I equally think critics are good @ creating excuses for themselves. A simple way out of it will be to be quiet when we honestly can’t make it constructive. A better way is to highlight the good before pointing out the “not-good”. But this isn’t to say that the obvious shouldn’t be stated when it is needed and possibly with solution/suggestIoNs. Happy Birthday to mummy. May God Bless & grant her more years of fulfilling God’s purpose for her. Amen. You just taught me something now…”Highlighting the good before the not so good.” Thanks sir.